This is a sponsored post written by me on behalf of Halo Top Creamery. All opinions are 100% mine. Not that we need a reason to eat ice cream or anything, but it sure does hit the spot when it’s warm out. Have you tried Halo Top yet? It seriously piqued my curiosity, but this was my first time picking some up. Just one word comes to mind after taking my first bite. Wow. When I realized the entire pint had only 240 calories, I almost lost my cool… *runs to Walmart to stock up*. Now, you know I’m all about cute things. 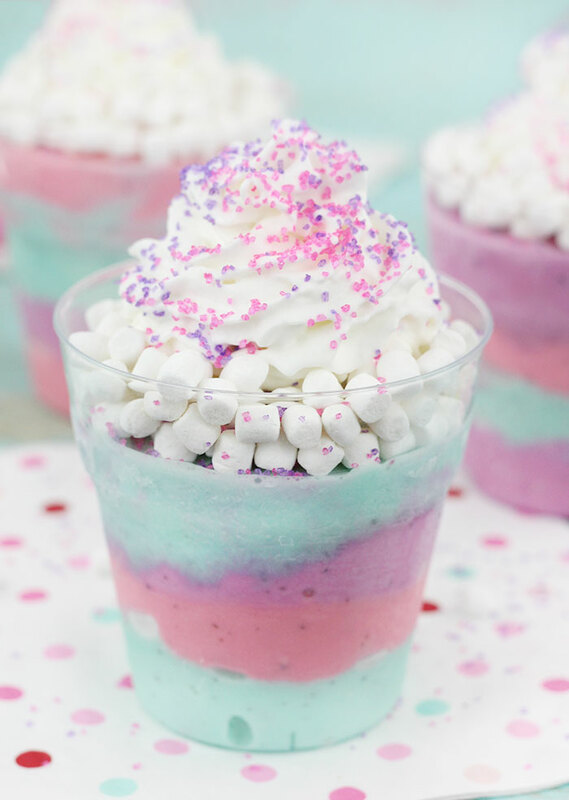 Unicorn foods are right up there, so I just couldn’t resist making Unicorn Sundaes that are actually low in calories with the rich Vanilla Bean flavor. Get ready for magic for your mouth. Let’s do it! This Halo Top Vanilla Bean light ice cream only has 240 calories in the entire pint. As an added bonus, it even had ice cream. A lot of ice cream that’s made light kind of tastes like something is missing. This ice cream is actually more delicious than other regular vanilla ice cream I’ve had. It almost can’t be explained, the flavor is rich and delicious. I’m totally in. When I first picked up Halo Top at Walmart, my intention was to just take a bite to taste it. Half a pint later… I had no idea what happened. This is the kind of ice cream that you can actually feel good about. If I hadn’t already eaten a treat already that day, there’s no doubt that I would have polished off the entire pint. I’m seeing a lot of fully enjoyed pints in my future. To harness the magic that is Halo Top ice cream, I thought unicorn sundaes would be the perfect dessert to express my instant love. 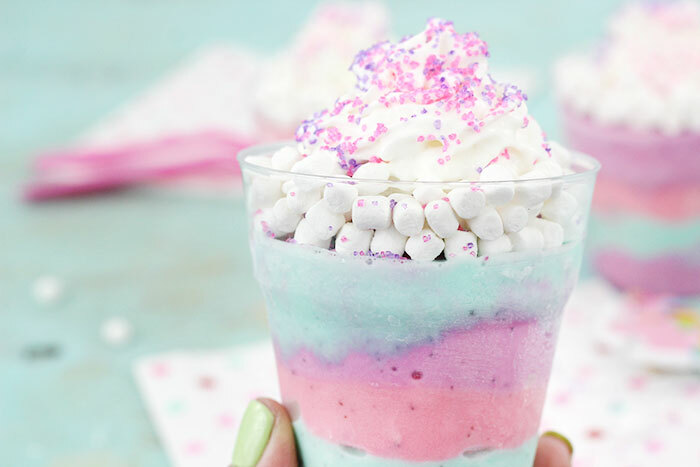 These little pastel ice cream treats are super simple to make and would be great for unicorn themed parties which are totally trendy right now. Divide the two Halo Top Vanilla Bean ice cream pints into three equal bowls. Add 3 drops of each neon food coloring in each bowl making pink, purple and teal. Use a spoon to mix until the color is complete dissolved. Use a spoon to make layers in small freezer friendly cups. Have fun with it. The layers don’t have to be perfect. Matter of fact, the more mixed up the colors are, the cooler they are to look at. Cover these cups and store them in the freezer for about 2 hours. Once they are re-frozen, they are ready to top and serve. For an extra fun treat, layer marshmallow bits around the top of the ice cream. 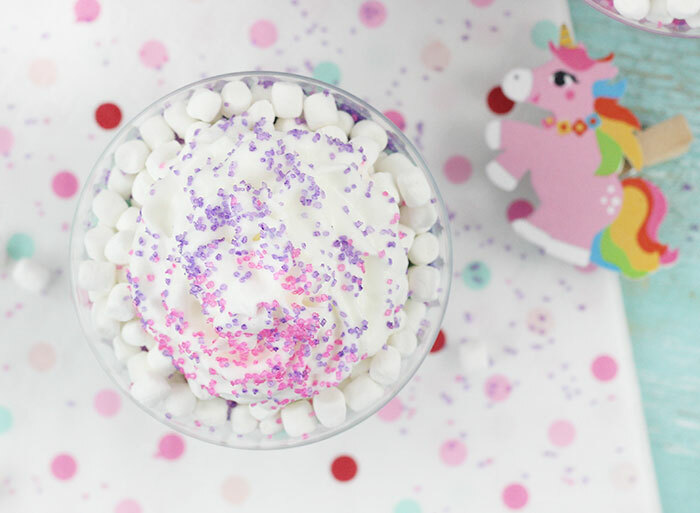 Add a swirl of light whipped cream and top with your favorite unicorn inspired sprinkles. I used a combination of pink and purple sugar crystals. I just adore they way they came out. So simple and so tasty. Want more inspiration? 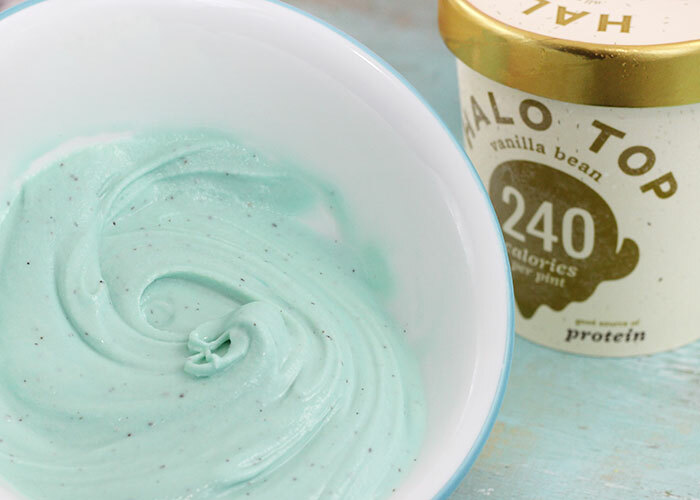 Get inspired with these Halo Top recipes. Check out these flavors: Vanilla, Chocolate, Mint Chip, Birthday Cake, Cookie Dough, Sea Salt Caramel, & Peanut Butter Cup. 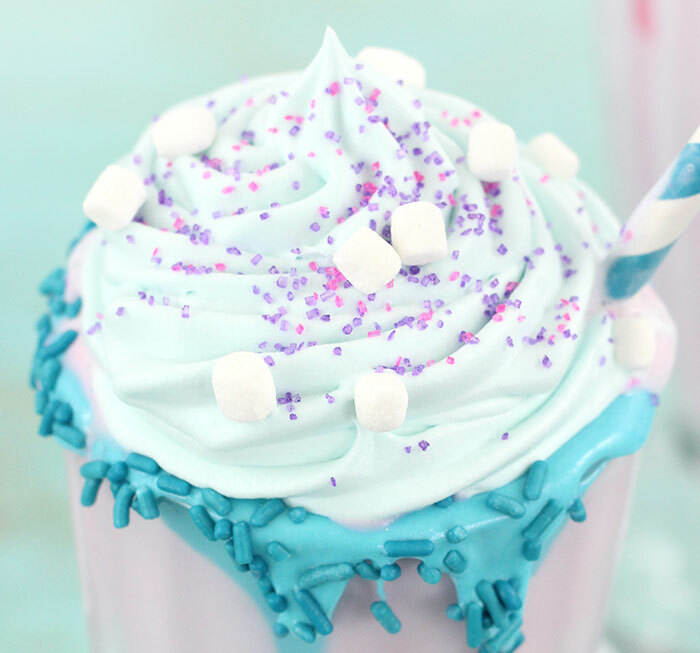 If you liked these Unicorn Sundaes, go here for Unicorn Milkshakes. 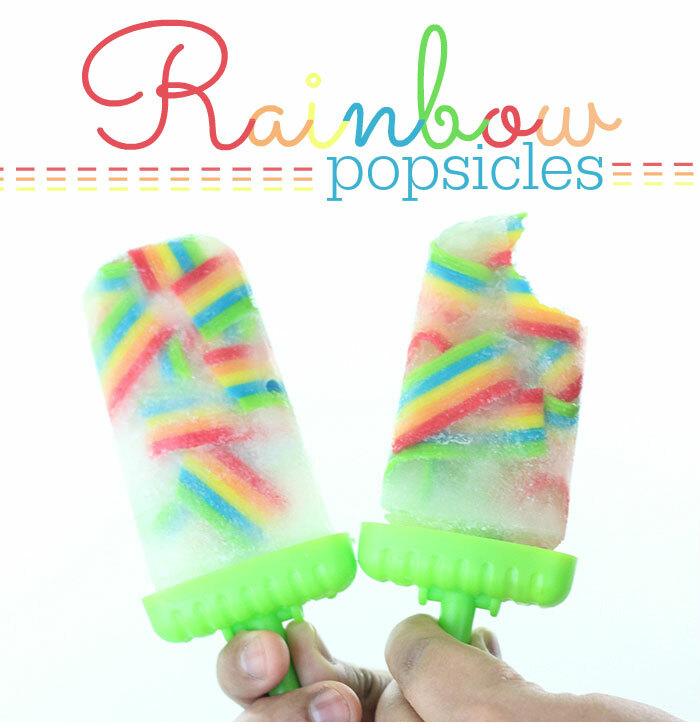 Get this Rainbow Popsicles recipe too. Yum! These look awesome... can wait to make some this summer with the kiddos! Here's to hoping Wal-Mart has this in the northeast! Keep sharing these great recipes, i look forward to your daily emails for sick cute and inventive ideas! Um, should have done spell check before I posted.... although it is a funny autocorrect....i mean such cute, not sick cute! Prego-brain!